If want a French bread recipe to make at home here are a few that are truly delicious. Some are made by hand, although you could cheat and use your bread maker if you wish. It's not everyone's cup of tea I know, to spend hours in the kitchen making bread, although sometimes it is well worth it if you have the time and patience...not least because of the lovely aroma that fills the house. 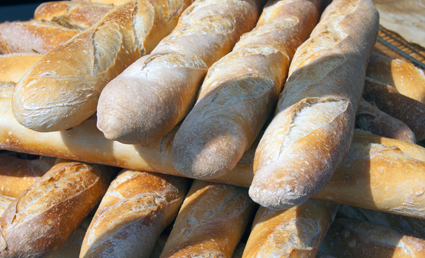 The French baguette is a good example – it is an icon of France. But because the French are passionate about their bread they would be quick to say that no bread is as good as the bread in France. So to all Francophiles, I apologise and would simply say that the French bread recipe given here is far superior to any that is commercially made in any other country...other than France! The main difference in a French bread recipe is the flour they use. The flour is from a particular type of wheat, unbleached, light flour, very fine and free flowing. If you cannot get French plain bread flour, then use a good quality strong bread flour instead. I just use a good quality bread flour and have no problems. However, there are some other factors to take into consideration. I live in the United kingdom and okay, it's not the coldest place on earth, but it's not always the warmest either. So, basically what I am saying is that you will get better results in the summer than in the winter due to the temperature in the kitchen! The temperature affects the dough rising, so you need to have a warm room for the best results. So delicious and the most well known of French breads. You can now make it at home and give your family and friends a real treat. French brioche is one of the most classic breads from France and is most popular in the form of little brioche buns. Here is an easy version using your bread machine and giving you fantastic results. A truly delicious French Croissant recipe for you to make this wonderful French classic breakfast. It is an easy recipe to make and will give you the most light and buttery croissants you have ever tasted. Heavenly! This is one of the oldest and most popular breads in France, and made just about everywhere, each region having its own twist. What better way to use up your stale bread than to make this truly tasty French toast! It is easy, everyone loves it and it costs very little. The French would never waste their bread, it's sacred, so keep this recipe in your kitchen and enjoy this wonderful toast for breakfast or for an 'anytime treat'. For another treat, the classic French milk rolls are simply delicious and so easy to make. You may know them as Petit Pains au Lait, their French name of course. A delicious gluten-free, vegetarian- and vegan-friendly chickpea flatbread that is so easy to make.